A4 Size 6.6 x 10.7 in. (168 x 271 mm) 8.3 x 11.7 in. A3+ Size 10.9 x 17.5 in. (275 x 445 mm) 13 x 19 in. Vajradhara (Tib. Dorje Chang), meaning the 'vajra-holder', is the primordial or Adi-Buddha of the Sarma or 'New Translation Schools of Tibetan Buddhism, while Samantabhadra is the primordial Buddha of the Nyingma or 'Old Translation School'. These two deities are the only manifestations or deified expressions of the dharmakaya or ‘truth body of enlightenment’ in the entire Vajrayana Buddhist pantheon, and are viewed as the respective sources from which the Mahamudra and Dzogchen transmission lineages emanate. Thus Samantabhadra traditionally appears crowning many Nyingma lineage or deity thangkas, while Vajradhara usually crowns thangkas belonging to the Sakya, Kagyu, Kadampa and Gelugpa traditions of Tibetan Buddhism. In the Kagyu lineage Vajradhara is recognized as the direct source of the tantric traditions that were transmitted by the Indian mahasiddhas Tilopa and Naropa, and then disseminated in Tibet by Marpa Lotsawa and his illustrious lineage, which includes Milarepa, Gampopa and the first Karmapa, Dusum Khyenpa. Both Vajradhara and Samantabhadra are deep-blue in colour, which represents the unchangeable ‘emptiness’ or space-like nature of the dharmakaya. But whereas Samantabhadra is represented in the aspect of a naked and unadorned buddha, Vajradhara appears wearing the thirteen silk and jewel ornaments of a sambhogakaya deity. Essentially Vajradhara represents the secret aspect that Shakyamuni Buddha assumes in order to reveal the Tantras. He is the source of the 'Five Enlightened Families', who represent the five purified aggregates of form, feeling, perception, motivation and consciousness. And as such he is sometimes known as the 'Lord of the Sixth Family of all Vajrayana mandalas'. In this classical Tibetan composition Vajradhara is shown on the enlightenment throne of a buddha with its ‘six-ornament backrest’, and is flanked by the two bodhisattvas yellow-orange Manjushri and blue Vajrapani. Vajradhara is regal, peaceful and deep-blue in colour, with a sweetly smiling face, two beautiful bow-shaped eyes, and two arms. He leans slightly towards the right as he sits in adamantine vajra-posture upon a white moon-disc and blue lotus that rests upon a lion-throne. This exquisite throne is fashioned from gold, silver, lapis-lazuli and all manner of precious gemstones. Each of its four sides is supported by a pair of white snow-lions with turquoise-green manes, while the front section of the throne stands out from the lion-facades on either side. This front section is covered with a pleated gold and green silk cloth of embroidered silk, with a bowl of jewel offerings placed before it. Vajradhara’s two arms are crossed in front of his chest in vajra-humkara-mudra, with his right ‘method’ hand holding a golden five-pointed vajra in front of his left ‘wisdom’ hand, which holds a ritual silver bell with a half-vajra crowning its top. The vajra and bell symbolize the union of his skillful means (method) and pristine awareness (wisdom). Half of his long sapphire-black hair is bound up into jeweled topknots, while the other half hangs freely down his back. His lower body is adorned with a skirt and apron of embroidered multicolored silks, and a long green silk scarf billows gracefully about his body, arms and thighs, with its tapered ends hanging down below each of his knees. His elaborate golden crown is adorned with five tear-shaped jewel emblems, with a small ‘face of glory’ (Skt. kirtimukha) decorating its headband, which is fastened by a thin red silk ribbon that passes around his head and billows behind his ears. His exquisite earrings; short, medium and long necklaces; jeweled belt; bracelets, armlets and anklets, are all likewise fashioned with delicate pendants and chains of gold, and studded with all manner of precious gemstones. Behind Vajradhara’s radiant aura and halo arises the 'six ornament backrest' of his enlightenment throne, which represents the six perfections (Skt. paramita) of patience, generosity, discipline, effort, meditation, and wisdom. At the throne's base are two jewel-bearing white elephants with silk saddle-blankets that stand on lotus seed-heads. Above are a white lion (left) and a blue lion (right), and above again a winged blue antelope or mythical sharabha (left) and a garuda-lion (right). Lotus stems entwine around these six creatures and support a golden cross-beam that is draped with silk and adorned with blazing blue gemstones. Crouching upon this golden beam are two fierce makaras or ‘water-monsters’ with raised snouts and fabulously long multicolored tails, which entwine and scroll upwards to touch the golden aureole above garuda at the top. Garuda’s body is red, with blue wing and tail feathers, and he bites down upon a long green naga-serpent with his sharp beak. His sharp talons grasp the feet of a leaping white naga-king and naga-queen with legs and long serpentine tails, who are both crowned with a hood of seven small naga-serpents. The interior of this upper makara-naga-garuda arch or torana is coloured red, while its exterior is encircled by clouds. 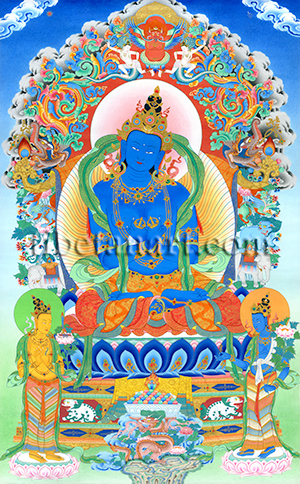 Orange-yellow Manjushri and blue Vajrapani are both adorned with halos and stand upon white moon-disc and pink lotus pedestals, and each are adorned with divine silk garments and the eight jeweled ornaments. Manjushri, as the bodhisattva of wisdom or pristine awareness makes the two-handed dharmachakra-mudra of teaching in front of his heart, with his left hand holding the stem of a lotus that bear his twin attributes of a text on the ‘Perfection of Wisdom’ (Skt. Prajnaparamita-sutra) and his blazing sword of discriminating awareness. While Vajrapani, as the bodhisattva of power or energy, holds the stem of a pink lotus in his left hand, and an upright golden five-pointed vajra in his right hand. The Chinese-style rock formation at the bottom centre is crowned with lotuses and leaves, and a coiling dragon amidst clouds. With his two upper claws this dragon holds aloft a crystal bowl filled with multicolored gemstones, which is crowned with a blazing eight-faceted wish-granting jewel.